I always feel a little nervous about the first week of Speech therapy after the summer break - lots of new students to get acclimated to, new behaviors to tackle, trying to get back into the groove, etc. 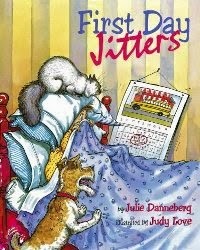 I'm sure some of my students feel the same way about returning to school, so I thought the perfect way to ease back into our routine would be to read the book "First Day Jitters" by Julie Danneberg with some of my students. This is by far my favorite Back-to-School book, mainly because of the unexpected surprise ending. The story describes the main character feeling apprehensive about her first day at her new school because she is worried the other kids won't like her. At the end, when she finally makes it into the classroom, my students were stunned to learn that the main character is the teacher! This book is great for introducing vocabulary such as "jittery", "apprehensive", "surprise ending", "unexpected". I also used it to teach the students that feeling nervous is a universal emotion, and adults may feel that way, at times, as well. My students and I brainstormed situations that make us feel jittery, and drew pictures for these situations. 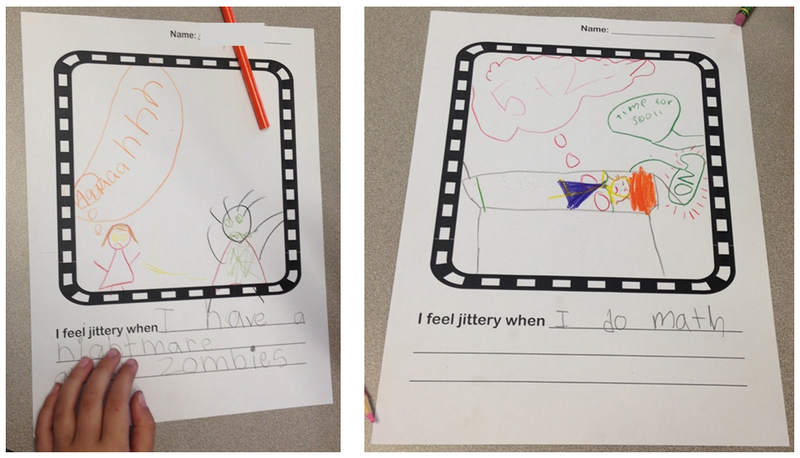 Zombie nightmares make this 1st grader feel jittery.. ...and math makes this 2nd grader feel anxious. This was a fun and easy intro activity for the new year!